Catit Design Centre Massage Centre for Cats has been expertly developed to engage with your cats incredibly heightened sense of touch, offering an assortment of luxurious textures. When combined with catnip (included), this enticing product offers a wonderful, multisensory experience for your cat, appealing also to their sense of taste and smell. Featuring a gum stimulator that effectively massages and cleans the teeth and gums to promote excellent oral health. The ripple effect provides an intense massage to head, neck and face areas. An Accu-Pressure Mat provides a satisfying pressure point paw massage and the body stroke groomers that complete this product help massage and groom body area. 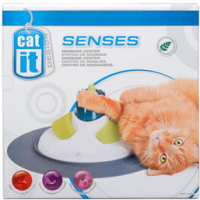 Catit Design Senses products can be purchased individually, or be purchased together to create a complete Sensory Activity Center for your pet.